][align=center]Home at last, home sweet home.[/align].. This long known plant was one of the first to cross the Atlantic.The plant is an olimpic swimmer, a prodigious creature! 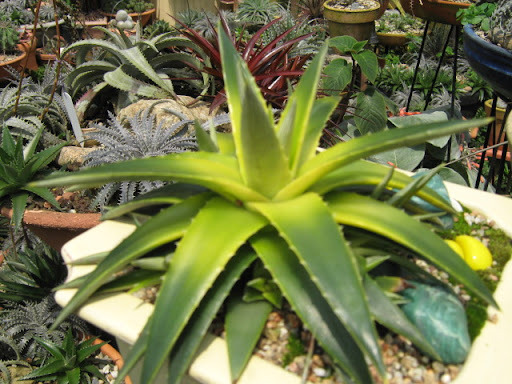 Dyckia marnier, fosteriana and dawsoni followed its steps (fathoms) and they all turned to be classical Dyckias outside Brasil, all very good sailors or fliers. The new discoveries especially the southern ones are very difficult to be seen outside Brazil. The more Northern new species seems to be just a matter of time and money and they learn how to swim bravely to Europe , Asia and America. 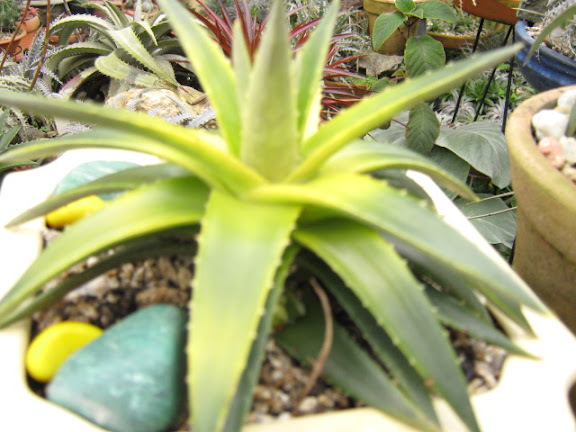 For a Dyckia to swim back to Brazil it is far more difficult. When I saw this beauty with golden glow I felt in love and asked everybody to send one to me . No one got moved until some guy in Japan e.mailled saying he had already sent one to my address. One and I managed to give him back some precious natives. Well, in just one year this plant turned in 12 new plants and I am tottaly up to my nose with this marvel. A human touch may do wonders to a plant and this learned how to swim back to my Santa Catarina and reproduced wonderfully and fast. Dyckia brevifolia golden glow an olimpic swimmer that learned how to swim back to Brazil. What an epic journey! Got back renewed, updated, bettered in many ways. The photographer is very happy but continue to be a lousy one look the low quality of the pic. I had to have one of these as soon as I saw them, but I was lucky to be in a nursery with some for sale so there was no waiting!! I found it to be prolific as the green D.brevifolia and wondered why there wasn't more around??? Has this cultivar only been around for a short time?? #1 When the plant gets too much water(extremly rainy periods)it tends to split its leaves. #2 One of the offsets from my original plant has refused to turn yellow whilst growing under the same conditions as its siblings. Is this an unstable plant ?? Sanga, your brevifolias are just great! Almost all Dyckias split in too much water. t seems it is not just too much water but also too much nitrogen and this two factors altogether, combined, leads to the leave spliting. In nature this plant lives as a reofitic one. They have to cope with very harsh situations and may be under water for weeks when the river is uploaded with water. There are times when they do not get any water for months. They all live on rocks in the river banks or in stony islands. In september they bloom anouncing springtime here and the hummingbirds get crazy for their nectar. It is a Show. Your plants are getting good quality sun, by their looks. Yes this plant seems to be very instable but I just think they are superior plants. In nature I found one that has reddish stripes, two years ago. I did not took it from nature as it was a only one. I have a very short experience with such golden brevifolia, ok? Be good and keep away from the Australian sea water they are lethal! I lost a friend attacked by a kind of sea bee. She died in one hour after the enconter with this small sea creature. I miss her.